Ever since the late-sixties, Berlin has been home to some of the most innovative bands in German musical history. That was the case from the time when all the freelance musicians in the city found their way to Zodiak Free Arts Lab, in West Berlin. That was a meeting place for members of Can, Tangerine Dream, Ash Ra, Cluster and Neu! Some of these bands even honed their skills on the stage at the Zodiak Free Arts Lab; before embarking upon a musical journey that saw each group release several classic albums. Since then, Berlin’s music scene has always been rich and diverse. So much so, musicians from all over Germany made their way to Berlin. They saw the city as Germany’s cultural capital. That is still the case today. Nowadays, musicians travel from all over Europe to Berlin. They’re determined to tap into the city’s cultural capital, in an attempt to further their career. What many newcomers to Berlin discover, is a city with a thriving music industry. Many record companies have chosen Berlin as their headquarters. Similarly, many recording and mastering studios are housed in Berlin. This makes the city the perfect place to form a group. That’s what three young Berlin based musicians decided to do. Franz Bargmann, Michael Drummer and Timm Brockmann founded Neo-Krautrock group Camera. They were soon making an impression on Berliners. Especially given Camera’s propensity for putting on impromptu gigs in public places. Camera would turn up, plug in their instruments and play. This got the attention of Berliners. Soon, they were talking about this new band, Camera, and their fondness for what were being called “guerrilla gigs.” Their pièce de résistance came at the after-show party for the German Film Prize. Cool as a cucumber, Camera turned up, set their equipment up and got the party started. All was going well until one of the security guards twigged that Camera hadn’t been booked. However, this situationist event resulted in publicity aplenty for Camera. Critics and cultural commentators drew comparisons with the original Krautrockers. This was the type of stunt Amon Duul, Faust and Neu! would’ve pulled forty years earlier. One of the musicians responsible for similar situationist events was watching with interest. Michael Rother the former guitarist in Kraftwerk, Neu! and Harmonia had played plenty of similar impromptu gigs. He had a similar rebellious steak, and admired Camera for this…and of course their music. So much so, that when Michael Rother was playing live, he asked Camera to open for him. Later, when Michael Rother was reunited with former Harmonia bandmate Dieter Moebius, Camera and Admiral vocalist Shaun Mulrooney were asked to share the stage with them. They took to the stage at the HBC in Berlin, on Ooctober 22nd, 2011. That night, Krautrock’s past and present became one. Since then, Camera’s star has been in the ascendancy. Now, Camera are regarded as one of the leading lights of the Neo-Krautrock scene. Camera’s 2012 debut album Radiate was released to critical acclaim. Critics compared Camera to Krautrock legends Neu! and La Düsseldorf. This was high praise indeed. Fittingly, given the comparison to Neu!, Camera Live at HBC was released later in 2012. It featured a trio songs Camera recorded with Michael Rother and Dieter Moebius of Harmonia. These songs had been recorded for posterity, and were a reminder of the night two generations of Krautrockers shared the stage. That night had been a meeting of musical minds. However, this was just another part of Camera’s musical adventure. The next part of this adventure took place in 2014, when Camera released their sophomore album Remember I Was Carbon Dioxide. I is best described as a genre-melting album. Krautrock was merely a starting point for Camera, as they continually flitted between, and fused musical influences and genres. Just like Radiate, critical acclaimed accompanied the release of Remember I Was Carbon Dioxide. By then, Camera’s music was reaching a much wider interest. The whole Neo-Krautrock movement had grown in popularity. Similarly, there was a resurgence of interest in Krautrock. Suddenly, a new generation were discovering the groups that had influenced Camera on their first two albums, Radiate and Remember I Was Carbon Dioxide. However, soon, two will become three when Camera release their third studio album Phantom Of Liberty. It will be released by Bureau B on 5th of August 2016, and marks the welcome return of Camera. 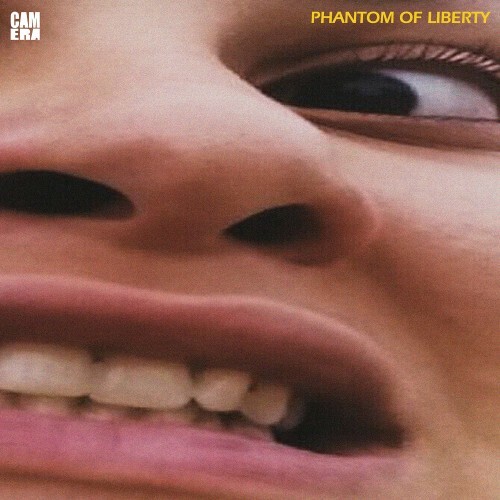 For Phantom Of Liberty, the three members of Camera wrote eight new tracks. They were recorded at various sessions during 2015 and 2016. The studio chosen was Kellerloch at Malzfabrik, Berlin. This was where Remember I Was Carbon Dioxide had been recorded. So drummer Michael Drummer, guitarist Franz Bargmann and keyboardist Timm Brockmann were returning to familiar surroundings. Producing Phantom Of Liberty with Camera, was Steffen Kahles. Eventually, the eight tracks were completed earlier in 2016. This left just two things to do. The first was to mix Phantom Of Liberty. Emanuele Baratto had been chosen to do so. He mixed Phantom Of Liberty at Big Snuff Studio, in Berlin. That was where he mastered Phantom Of Liberty. Only then was Phantom Of Liberty ready for Camera to release. Affenfaust opens Phantom Of Liberty. Squelchy, acidic synths combine with relentless drums and a distant, chiming, stadium guitar. They create a hypnotic, mesmeric backdrop. That’s until synths make an appearance, adding first light, then darkness and drama. However, at the heart of the arrangement are the Klaus Dinger inspired drums. They’re pounded and punished and occasionally, cymbals crash. Meanwhile, washes of futuristic, space age synths emerge from the arrangement. Later, the tempo begins to drop, and nearly grinds to a halt. Futuristic synths join radio chatter and rinsing cymbals as the arrangement meanders along, still sharing a myriad of subtleties, surprises and secrets. By then, the arrangement has taken on a cinematic quality, and sounds as if it belongs on a sci-fi movie. The keyboards that open Fröhlichkeit wouldn’t sound out of place on a seventies progressive rock album. They’re played quickly and accurately, before the drums power the arrangement along. It’s reminiscent of the classic Krautrock of Can and Neu! There’s the same mesmeric quality; which is interrupted by occasional flourishes and drum rolls. Soon, Camera are playing as one. Banks of keyboards buzz and add the melody. They veer between cinematic, futuristic, robotic, shrill and occasionally elegiac and ethereal. Sometimes, it’s as if Camera are providing the soundtrack to a journey, a la Kraftwerk’s Autobahn or Trans Europe Express. During this memorable and melodic journey, Camera combine elements of Krautrock, electronica and progressive rock. Straight away, here’s an Eastern influence to Festus, as the arrangement meanders along. Lysergic drones join drums and percussion. Soon, a scorching, blistering guitar cuts through the arrangement. It doesn’t overpower the other instruments though. No. Instead, a bass prowls, while a myriad of otherworldly lysergic sound flit in and out this soundscape. It’s sculpted by Camera. Nothing is as it seems. Effects have been added to many instruments. Playing a leading role in this fusion of avant-garde, improv, Krautrock, rock and Eastern sounds are the drums, percussion, guitar and bass. They play their part in what’s a captivating and lysergic track that seems to have has been influenced by the music of the sixties and seventies. Nevernine literally explodes into life. Effects have been used to shred Nirvana-esque guitars and keyboards. They’re hidden behind a fuzzy mask while the arrangement unfolds at breakneck speed. Powering the arrangement along are thunderous drums. Meanwhile, panning is used on the rest of the arrangement. Then some of the fuzzy mask is lifted. Soon, volcanic keyboards are playing a leading role, as they bubble and threaten to explode. The guitar is played with speed and accuracy, adding a rocky hue. By then, the keyboards sound as if they belong in a cathedral. They’re soon overshadowed by a machine gun guitar. It bristles and feedbacks, before Camera slow things down. As the drums drop out, it’s just the keyboards and thoughtful guitar than remain. Then when just the keyboards remain, this magical musical mystery tour is totally transformed, and meanders along to its genre-melting conclusion. Deliberately and dramatically, keyboards play on Ildefons. Soon, though, it’s all change, as drums crack and lysergic synths join a scorching guitar solo. It cuts through the arrangement like a flamethrower. Meanwhile the bass locks into a groove with the mesmeric drums. Still the blistering guitar is playing a starring role. That’s until the space-age keyboards make a brief appearance. Then the baton passes to the guitar, before the ghostly arrangement begins to dissipate. All that’s left is the memory of Camera at their most inventive, imaginative and innovative. That’s why they’re regarded as one of the leading lights of the Neo-Krautrock scene. Reindenken/Raus opens with two samples. Someone walks along a road, and then a car starts. This is a homage to Kraftwerk’s Autobahn. Meanwhile, a guitar is plucked as keyboards play. Soon, though, the samples drop out. This is the signal for the rhythm section and futuristic synths to combine. They jam, playing with a fluidity. As guitars wah-wah, the synths follow in their footsteps, adding an atmospheric sci-fi sound. This harks back to the synth sound found on many seventies’ Krautrock, Berlin School and progressive rock albums. Later, synthetic harmonies add an elements of darkness and drama. By then, the arrangement meanders along, and its cinematic sound invites the listener to let their imagination run riot. Alas the track is almost over. That’s when the tempo increases, and synths chatter as if sending out a message. Maybe that message is that Reindenken/Raus is the highlight of Phantom Of Liberty? Synths are panned on Tjamahal before drums provide a stomping beat. Soon, synth glide across the arrangement, which is a mass of bristling, shredded guitar, synths and relentless drums. They drive the arrangement along as synths buzz and beep. Still, the guitar has been mangled by effects. This works, and it plays a part in this stomping arrangement. By then, the synths veer between glacial and elegiac, to grinding and buzzing, to a futuristic sound. Along with the drums, they play starring roles in this irresistible, stomping, swaggering track. Tribal Mango closes Phantom Of Liberty. Ethereal describes the arrangement, as drones carry the elegiac harmonies along. A dubby vocal sounds as if it’s carrying out some quasi religious ceremony. Then at 1.34 it’s all change. The bass is joined by synths and a spoken word sample from the Apollo space missions. Soon, it’s joined by the rhythm section and a Hendrix inspired guitar. Effects have been used heavily, and sometimes the guitar feedbacks. Other times, it chimes, rings out and wah-wahs, joining the hypnotic, relentless drums. Elegiac synths are added, while the sample chatters away. A blistering guitar solo is unleashed, and sits atop the rest of the arrangement. It’s akin to a jam, with the members of Camera showcasing their versatility, talent and improvisational skills. Everyone plays their part as they keep one of the highlights of Phantom Of Liberty until last. 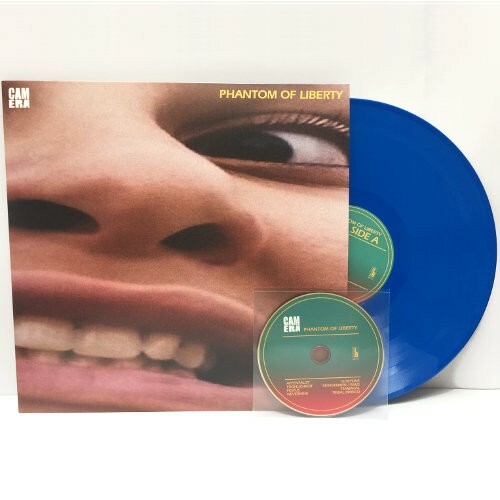 Two years after the release of their sophomore album Remember I Was Carbon Dioxide in 2014, Camera return with the finest album of their career, Phantom Of Liberty. It’ll be released by Bureau B on 5th August 2016, and finds the Neo-Krautrockers release a career-defining album. 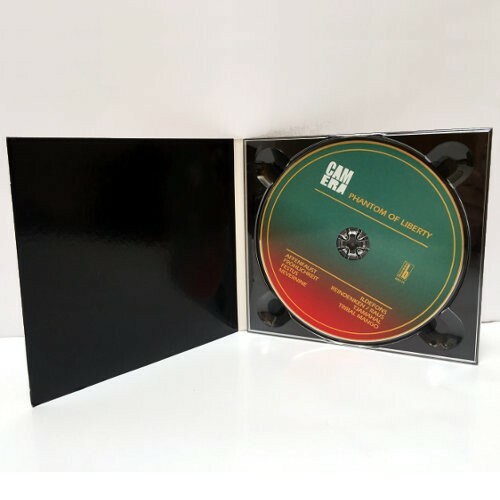 They take as their starting point Krautrock, and add to that, elements of avant-garde, Berlin School, electronica, improv, progressive rock, psychedelia and rock. Seamlessly, Camera switch between, and fuse musical genres within the one track. Mostly, though, the hypnotic, relentless drums power the arrangement along. They’re reminiscent of Can, Neu and La Düsseldorf. Often, the drums sound as if they’ve been inspired by Klaus Dinger. Sometimes, the guitars have a Michael Rother influence. Apart from that, the influences are varied. Among the groups to influence Camera, are Krautrock legends like Can, Neu, Krafttwerk and La Düsseldorf. That’s apart from on two tracks. Tthe drums on Tjamahal sound as if they belong on a Led Zeppelin album. They’ve a much heavier sound, and are not unlike what members of Led Zeppelin affectionately referred to as John Bonham’s hooligan drum sound. Then on Festus, the drums are much more understated. Mostly, though, the drums are to the fore on Phantom Of Liberty. However, it’s apparent that other artists and groups seem to have influenced Camera. This includes Jimi Hendrix. He seems to have influenced guitarist Franz Bargmann, as he unleashes effects laden solos. 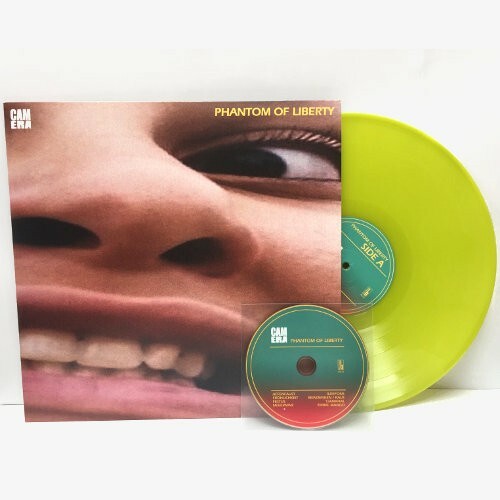 Some of the keyboard sounds on Phantom Of Liberty wouldn’t sound out of place on seventies progressive rock albums. The keyboards play an important part in the success and sound of Phantom Of Liberty. The keyboards are akin to a sonic pallet, which is used throughout the album. Often, the keyboards produce futuristic, space-age sounds. Other times, they produce ghostly, ethereal and elegiac sounds. This variety of sounds are part of Camera’s carefully constructed musical tapestry, Phantom Of Liberty. Camera spent part of 2015 and 2016 recording, honing and completing Phantom Of Liberty. All Camera’s effort has been worthwhile. Not only have they recorded a career-defining album, but what’s without doubt, one of the finest Neo-Krautrock albums of 2016.